We have a new look at Robert Englund who is back as Freddy Krueger for the first time in 15 years. Englund originated the role in the horror classic A Nightmare on Elm Street and, after nearly three decades, the actor decided to hang up the claws and put away the sweater in 2003. However, it was recently announced that Freddy is coming back for a special episode of The Goldbergs later this year and ABC has released a new promo photo that is sure to delight horror fans. 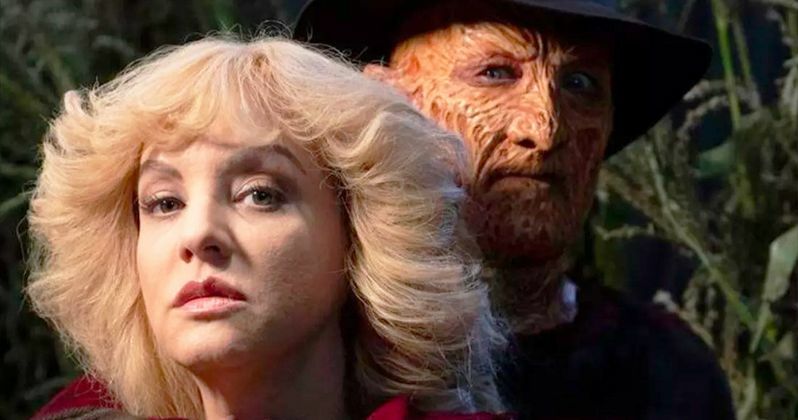 The image shows Robert Englund returning as Freddy Krueger in all his glory, coming up behind The Goldbergs star Wendi McLendon-Covey, with his forearm wrapped around her neck. This serves as a recreation of the iconic press photo that featured Englund with A Nightmare on Elm Street franchise star Heather Langenkamp, who plays Nancy. It was just part of a famed photoshoot used to promote A Nightmare on Elm Street 3: Dream Warriors, which many consider to be the best movie in the series. Englund took to Twitter to share the awesome recreation. Here's what he had to say about it. "The Goldbergs' Wendi McLendon-Covey gave me goosebumps too (ha!) when Yours Truly guest starred on the Halloween episode of The Goldbergs on ABC." Horror fans have, understandably, been going nuts ever since this news was first announced. Robert Englund has been very clear that he has no desire to do another movie as Freddy Krueger. The last time we saw him in the role was for Freddy vs. Jason, which was released in 2003 and, since a sequel never got off the ground, that served as his unceremonious retirement. The makeup process and the filming is grueling and Englund has stated that he's simply too old. But doing a single episode of a sitcom? That's much more doable. As such, ABC managed to lock him down for their upcoming Halloween episode of The Goldbergs. Creator Adam F. Goldberg actually teased fans prior to the announcement without them even realizing it. Taking to Twitter, Goldberg shared an article, in which, Robert Englund proclaimed he's not going to do another Elm Street movie, and expressed his desire to have someone do something to keep Freddy alive. "No! There's only one Freddy! Robert Englund can't retire! Elm Street 3 scared the crap out of me when I was a kid. I was so terrified I slept in the hallway for a week, but then became a superfan. Someone has to do something to keep the nightmares alive!" As it turns out, he was playing coy and Adam F. Goldberg is the man who did something about it. The Halloween episode of The Goldbergs is titled Nightmare on Elk Avenue and will air this fall. Though, ABC has yet to announced an exact premiere date, but we'll be sure to keep you posted as any new information about the episode makes its way online. Be sure to check out the Freddy promo photo, as well as a side-by-side with the Heather Langenkamp photo, for yourself below.